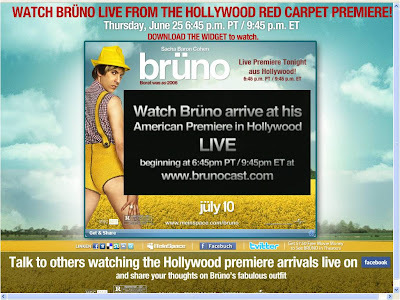 The latest Sacha Baron-Cohen film, Bruno, is making a splash in social media. 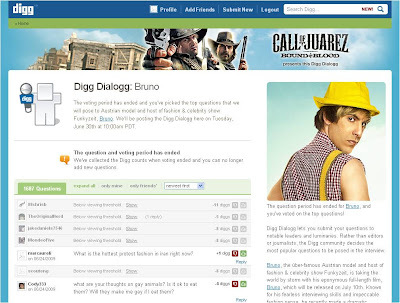 MySpace have created a Bruno version called MeinSpace.com, a Bruno Facebook Fan Page features lots of Bruno content, whilst the next Digg Dialogg will be with Bruno answering questions that have been submitted (and voted on) by the Digg community. There is also the obligatory Twitter account too. 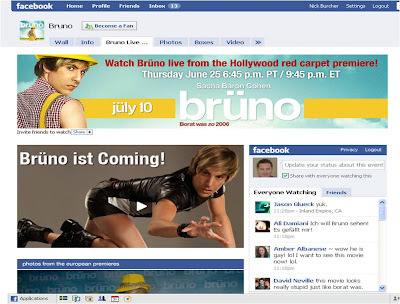 MySpace seemed to have scooped the other social networks with their Bruno sponsorship package (which includes MeinSpace, Bruno MySpace Home Page takeover and standard ads), however Facebook also seem to be agressively pushing Bruno. The number of Facebook Fans has leapt up very quickly (partly due to the volume of (new) sharing mechanics that have been included in the Bruno Facebook Page) and for me Facebook is now showing more Fans then Bruno has UK MySpace friends. MySpace UK is showing 132,516 Bruno friends with 89 comments, Facebook is showing 161,359 Bruno Facebook Fans - with 477 comments and 2,890 likes on wall posts from just today. After all the effort that MySpace went to in order to promote their Bruno tie up, I guess they will be disappointed if their numbers are beaten by Facebook - especially with MySpace billing themselves as an 'entertainment portal' vs the Facebook 'utility'?